At 21 years old, I, Emilee Lindner, am a homeowner. But not in the sense of the American Dream. You see, my house is on the Sims Social, and I bought it for 33,000 Simoleons. It gets confusing. Maybe this'll sort things out. 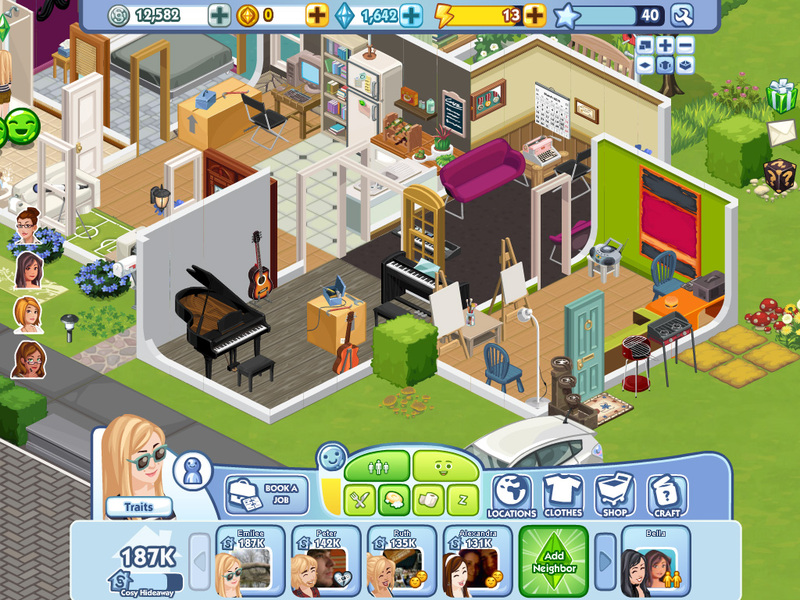 The Sims Social game on Facebook has 18.2 million monthly users, and it is one of the many platforms users can spend Facebook credits on. 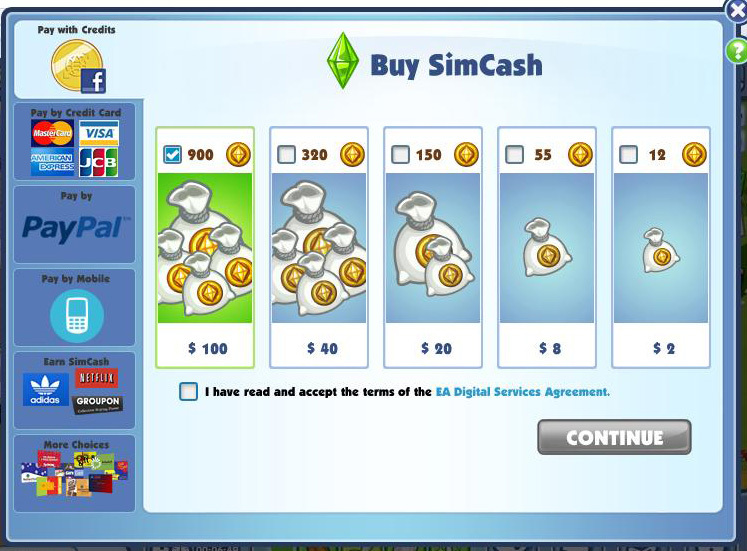 For $2, you can by 12 SimCash, which you could spend on stuff for your house, or you could covert it Simoleons, and then buy less-cool stuff. Forbes reported Monday that Facebook is worth $82 billion, with 18 percent of its revenue coming for the virtual goods transactions. 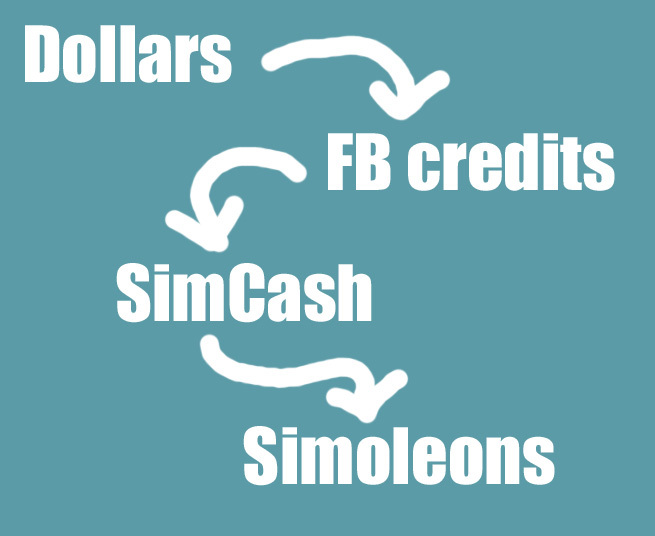 Facebook takes 30 percent of the sale of SimCash. The other money goes to the game’s parent company, Electronic Arts (EA Games). Facebook wants this virtual commerce to keep growing, so they are offering a sale on Facebook credits. I couldn’t bring myself to use actual money on this game, so I didn’t. I need to save my money for more crucial things – like food and my cell phone bill and college tuition. 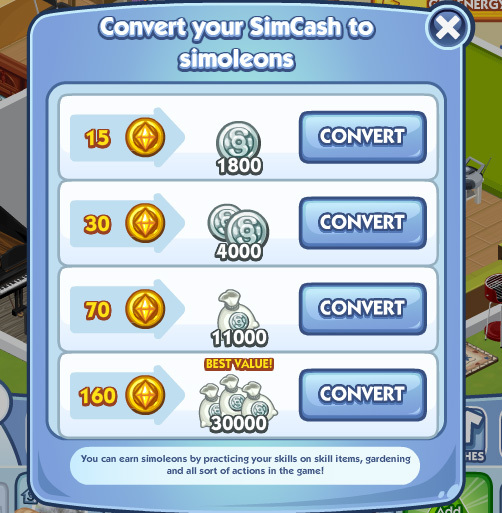 However, I had racked up enough SimCash from being a regular player to try out the system. I started off with 30 SimCash. If I was spending this money, I wanted to make sure I invested it well. So right off the bat, I invested in some Simoleons. 15 SimCash converted into 1,800 Simoleons, which I plan on using to buy a vacation home. (You can do that in the virtual world for only 12,000 Simoleons. Sigh. If only I lived in that world.) I went to the store to see what I could buy with my remaining 15 SimCash. They usually have some pretty cute items you can buy for your house. I never buy them because I never have SimCash, and I don’t usually see other players who have these items either. Pretty cool things, right? I think I’d rather have them in real life. I was disappointed with my purchases. They look neat, even though I think it’s hard to see my hamburger phone. But what’s the point? After I exit the game and close my laptop, I haven’t changed any. I haven’t acquired anything in the real life. I haven’t bettered myself or accomplished anything. In fact, I might have even procrastinated by playing the game. I love my stuff! 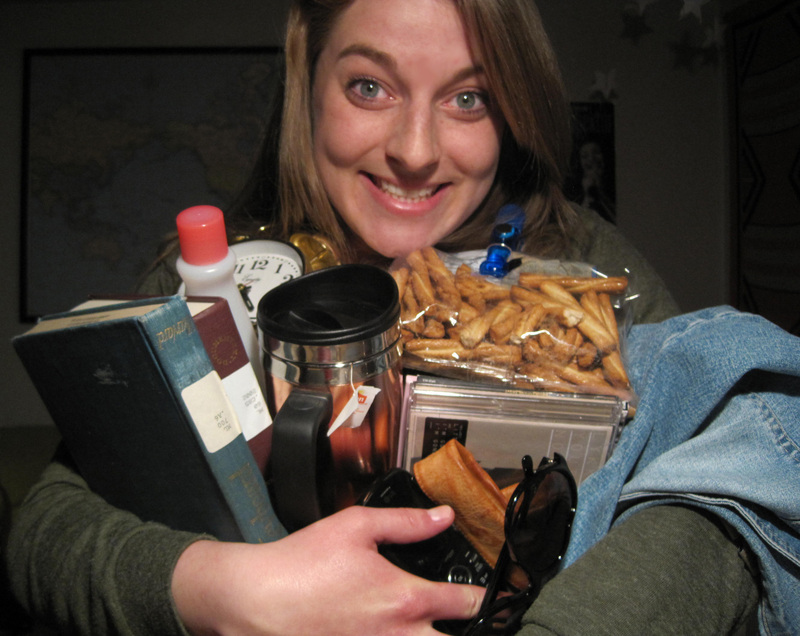 I love my real stuff — my pretzels, my sunglasses, my phone, my old-looking clock, my boots, my books (the ones in this picture actually belong to the library, but have an imagination), my coffee mug, my CDs (I still use them), my jean jacket and even my nail polish remover! You know why I love them? Because I can touch them, feel them, see them, taste them, smell them and hear them. They are mine. They aren’t pixels on a screen. I’ve earned them. ← Is Facebook sexist? and Go Bonnies! I decided it was a waste of life. So true. I see how people can get really obsessed with these games, but on the same token it’s like…why don’t you use that same time and energy into making your own life better? Even if it is only in small ways, it is still something.You still end up with more than what you end up with after playing Sims for hours.